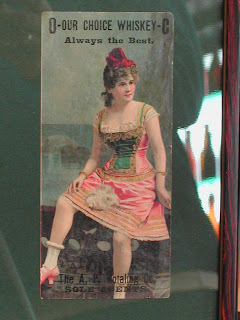 This advertising piece was purchased at the Auburn Bottle Show 12/08 advertising J.H. Cutter Whiskies Superior to them all. The A. P. Hotaling Company Sole Agent and I found the twin piece on e-bay in a group of paper items in March of this year. I think they both originated from the Oregon/Washington area. 7inches x 3.10 inches each. 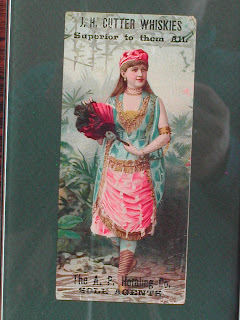 Very nice finds, but the gal on the left is showing a lot of leg for the time these cards were circulated. That photo was taken inside a convent, GO. Seriously, those little cards date from around 1890. as the rather "plain" women indicate. Hotaling sold his Portland business to Rothchild Bros in 1894, so you know that they at least go back before that.